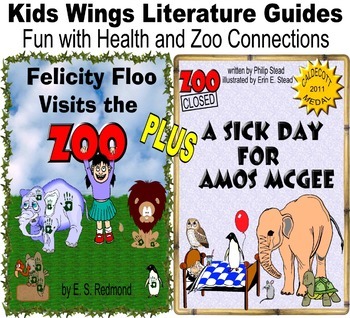 INTERRUPTING CHICKEN + 2 ZOO bks: FELICITY FLOO and SICK DAY FOR AMOS McGEE! Two amazing picture books will transport your students to the Zoo. In FELICITY FLOO VISITS THE ZOO (11 pages), your kids will see what happens when a very careless little girl doesn't use a tissue to wipe her nose and all of the zoo animals catch her cold. In Caldecott Medalist, A SICK DAY FOR AMOS McGEE (12 pages), your kids will see what happens when a beloved zookeeper who gets sick and is visited by his beloved animals. Little Chicken loves to hear her papa read bedtime stories. Papa loves to read them to her. The only problem is that Little Chicken gets so involved in the fairy tales he reads that she keeps interrupting and finishing them. 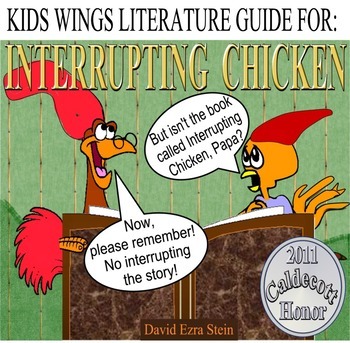 She sincerely promises her papa that she won't interrupt, but it's difficult for a little chicken who has such a vivid imagination. Finally, they try reversing the roles, but a funny thing happens when Little Chicken becomes the story teller and Papa listens. FELICITY FLOO VISITS THE ZOO by E. S. Redmond, An Award-winning Picture Book! Voice 1: Felicity Floo is feeling bad. Voice 2: Her temperature’s up just a tad. Voice 3: Her nose is runny and getting red. Voice 4: Shouldn’t she really be at home in bed? Felicity: No, today is the day that I go to the zoo! All: Go to the zoo? YOU? Felicity: You want to come, too? Voice 1: But Felicity, look at your nose! Voice 2: It’s runny and icky and red as a rose! Voice 3: And out of it’s coming gloppy, green goo! Voice 4: You need a big box of strong tissue! Felicity: That’s okay, I just use my hand to wipe off the most. All: Oooooo. Unbelievable! That’s so gross! Felicity is not careful about sharing the bacteria that made her sick. After she wipes her nose with her hands, she pets the animals, sharing her green goo and making them sick, too. Written in clever rhyme with hysterical illustrations, Felicity's story has great health simulation in the Kids Wings unit about controlling the spread of colds and terrific vocabulary, too! What Makes You Sick? What Makes You Well? These pages come to you in PowerPoint and PDF format. A SICK DAY FOR AMOS MCGEE by Philip C. Stead and Erin Snead, is the WINNER of the Caldecott Medal! Amos McGee is a kindly zookeeper who gives each animal the attention it needs. He patiently plays chess with the elephant. He sits quietly with the shy penguin. He dabs the rhinoceros's drippy nose with his handkerchief. He reads bedtime stories to the owl. He runs races with the tortoise and always lets him win. What do you think the animals will do when Amos gets sick and takes a sick day? Although written at 2nd and 3rd grade levels, these books are easily accessible to young students, partly because of the rhyme in Felicity Floo, and partly because of the sparce text on each page. 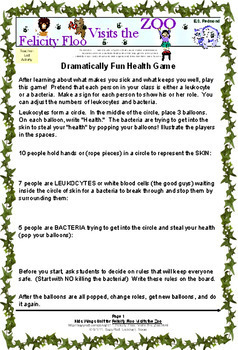 Kindergarten teachers can easily use the activities orally. PLEASE NOTE: Kids Wings materials are written by highly experienced master teachers. We hire professional proof readers who are also master educators. We do our best to be sure each of our literature guides is top quality and error free, and classroom tested, but if you think we can do better, we welcome your input. If you find an error in our materials, please email us at suzy@suzyred.com so we can make corrections. After it is revised, we will invite you to download a newly polished copy and will probably attach a surprise to our reply as a thank-you!